Travel Tour: South and Central Thailand in two Month. After we finish our high school a friend and I had two month for Traveling somewhere in World. We choose Thailand as our destination because the Land of many Smiles are cheap and easy to Travel. This was my second time in Thailand, some month before I was for holidays two weeks at Patong Beach on Phuket Island. On the 5th of July we had a direct flight with the Thai Airways from Frankfurt to Bangkok. Special thanks to Lonely Planet, the Travel Guide was a big help to find Timetables, Hotels, Guest Houses and Restaurant in this Southeast Asian Country. We arrived tired at the International Airport in Bangkok. A taxi bring us to “Sri Ayuttaya Guest House” in Thewet. We don’t spent long time in Bangkok, after one night we Travel by Tuk Tuk to Khao Sarn Backpacker Road where we changed in a VIP Travel Bus which go to Surat Thani. In Surat Thani we had a Ferry connection to Koh Samui. The turn from Bangkok to the Island in the Gulf of Thailand took us all in all 19 hours. 15 hours by bus, two hours waiting and two hours from Surat Thani Pier to Na Thon on Ko Samui. From Na Thon we took a share Taxi to our backpacker Destination New Hut Guest House at Hat Lamai Beach. All timetables at the Lonely Planet Thailand was up to date. Here on Koh Samui we spent nearly one week than we Travel by Ferry to Koh Tao. The Boat arrived the Island at Ban Mae Hat Pier, we took a taxi to Ban Hat Sai Ri, from here Marius and I walked to Laem Nam Tok to the “Here and Now” Guest House where we spent one Night. On the next Morning we Travel to the south of this small Island in the Gulf. Here we checked in the Sunset Hotel, after two days Koh Tao we Travel back by Night Ferry to Surat Thani. From here we had a Public Bus Travel connection to the small village Sichon in south Thailand. 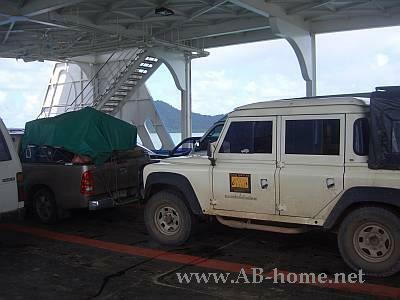 At Sichon we spent just one Night, on the next morning we was leaving to Nakon Si Thammarat. After two nights at the Thai Hotel we go by Minivan from Nakhon to Krabi Town. 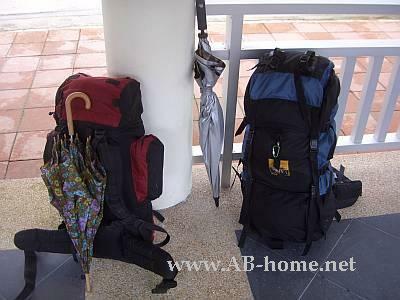 We was two days at the Cha Hostel in Krabi Town before we took a Ferry to Koh Phi Phi Don. We spent three days on our Thailand Travel Tour on the beautiful Island. Our next Destination was Phuket Town where we check in for two nights at the On On Hotel in the center of the Town on Thailands biggest Island. 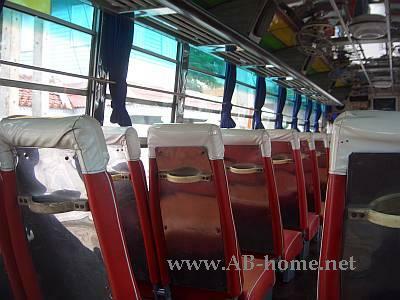 We go by Bus to Patong Beach where I meet some friends from my holidays in April. We was about one week in the “Touch Villa” Guest House before we leaved by public Bus to Phang Nga. After one night and two Days in Phang Nga. From this Southeast Asian City we took a Bus to the Bus Terminal in Ranong. After two nights at the Spa Inn in Ranong in South Thailand we Travel to Chumphon where we did a Travel Stop of two Nights on the way up to Phetchaburi. In Phetburi we sleep two Nights in a old Chinese Hotel before we go by Bus back to Thailand’s Capital Bangkok. This trip was about 3.5 hours. 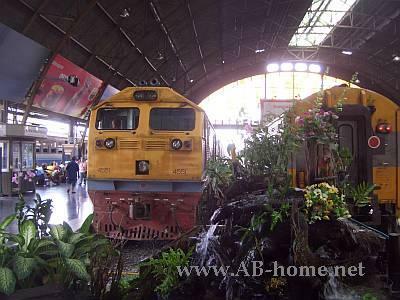 After about one week at the Sri Ayuttaya Guest House we was leaving Bangkok from the Hualamphong Train Station to Ayuthaya. The Royal Thai Railway needed 2.5 hours to the Train station in Ayuthaya. From the Railway Station we took a River Ferry over the Chao Phrom River and walked to our Guest House in Central Ayuthaya. After two nights in this historical city in Southeast Asia we Traveled by public Bus to Suphanburi. From Suphanburi we had a nearly non stop connection to Kanchanaburi. The Bus took us out somewhere in Town, we walked to the Pong Phen Guest House wich we found in our Lonely Planet Travel Book. From Kanchanaburi we took the Train to Bangkok. We took one Night rest at the Sri Ayuttaya Guest House. On the next morning we Traveled from Ekamai (eastern Bus Terminal at BKK) to Trat. In Trad we spend one Night at “Pop Guest House” in Trat’s Th Thana Charoen Road. A Taxi bring us to the pier in Laem Nop. It’s about 30 km out of Trat in Southeast Thailand. From there we go by “Center Point” Ferry to Koh Chang. Marius and I was going by Taxi to the Klong Prao Beach on the Island at the Gulf of Thailand in Southeast Asia. Here we stopped our Thailand Travel Tour for three weeks because we found that what we looked for, a nice Tropical Island to relax. And with Thale Bungalows we had a great Guest House to Chill Out and rest after five weeks traveling in South and Central Thailand. Our Plane back to Germany was leaving from Phuket. A friend bring us from the Island to BKK, from there we took a Bus to Phuket Town. This trip was about 17 hours in a VIP Bus from a Travel Agency. We sleeps one more night at the On On Hotel in Phuket Town before we Travel by Bus to the International Airport on Phuket. The Thai Airways Boeing 747 was landing in Frankfurt, from there we took a train back to our Hometown. 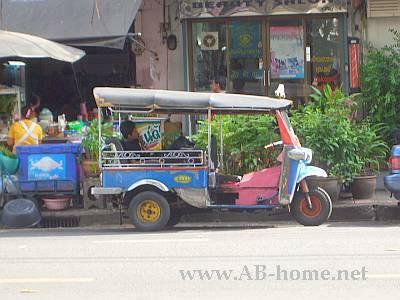 We enjoyed this Travel Tour, old Siam is easy to Travel for Backpackers and Travelers. With the public Bus you reach easy every Destination in this Asian Country. The transport, Guest Houses and Food is really cheap compared to country’s in Europe. Thailand is beautiful, we don’t was wrong with our adjudication to Travel the Kingdom! Try out this Country, it offer a lot for Backpackers Tourists and Traveler from around the World!